First I want you to take a look at the photograph of the guy in the picture. 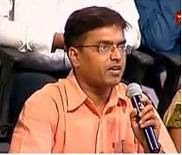 He was a participant on the HR side in the Vijay TV talk-and-debate show Neeya Naana. This guy made an idiotic and thoroughly dangerous claim against employing women. He made it on television and was recorded (the video clip in YouTube was removed because of copyright issues). No one challenged him. The host said the participant "was bringing up good points". The rest of this post is about the implications of such claims and some comments on Human Resources managers in that show. Most of what I write applies only to the offensive HR managers on that show. I have known some pretty good HR managers and I am not generalizing my comments. Gopinath, the Host: But there are companies which ask, in HR interviews, if a lady candidate plans to have a baby. This is a really bad rights violation. The man in the photograph, HR: But what is wrong with that? (at opposite side) Will you work with such a person in a project? The project just won't work. We are interested in the well-being of the project. In fact, let me ask - will you work without a salary? I won't either. Management is concerned about profit. What is wrong with that? Host: You are bringing up some good points. But aren't you concerned about employee's welfare? As I said, the show's clip has been removed from YouTube. But the debate was very acrimonious. There was no common ground between the two sides. There was a lot of yelling, particularly from the HR side. 1. HR started talking about fake certificates. They said this was a major problem and the host accepted it at face value. 2. They all kept coming back to layoffs. The HR side insisted that only poor performers were being laid off. I have no doubt one morning they woke up and found out that there were hundreds of poor performers in their company. What a shock! It had nothing to do with the economy or how their management planned poorly. It was the middle class programmers who are the problem! 3. In the end they brought in two "experts". The experts were a CTO guy and another HR guy himself. The HR "expert" said employees were spending too much. That was the problem, the host agreed. The employees had suddenly found money and were spending too much. When they lost their money, they blamed HR!!! In fact the host concluded the show by asking employess to spend less. No comment on companies which went nuts with hiring anticipating 1000% growth prospects. 4. The HR "expert" also said "we should blame ourselves" in this economy. When someone says "blame ourselves" what they mean is they are blaming everybody but themselves. Very common trick in India to start saying "we should blame ourselves". Ramalinga Raju steals money and gets caught!! Let us start blaming oursleves! 5. The CTO guy said every employee should think about how they would behave if they were a business owner themselves. That is, of course a neat trick itself. There are hundreds of books on why that is exactly the wrong thing to do. If every middle class guy started "imagining what he would support and oppose if he was a business owner" then he/she would end up just hurting themselves. I thought being a learned CTO, this guy would know that employees and business owners have opposing interests. That is why labor law is needed in the first place. For example, a business owner will love bonded labor - an employee, not so much. 6. A supercilious women on the HR side said employees were not hiding their cigarettes when she passed them by outside office. I am glad she did not want them to bend down and salute her. 7. In the end everyone agreed that the employees were spending too much; that only bad performers were being laid off; that HR were doing their best. No one objected or brought up again the critical issue raised by the HR guy in the photo: that companies need to find out if a woman plans to have a baby, and reserve the right to reject them on that grounds. Sometime back I wrote a post describing how corporations' point of views are heavily represented in media. This debate show is an example of that. It makes me so angry to realise how much powerful people get away with. We say that politicians abuse power. But abuse of power is a DEFINING characteristic of the Indian systems. The HR guys in this show have no problem questioning rights which were hard won by labor and have become part of law for the last 50 years. And they get away with it. The employees side was pathetic - they were completely outmanouevred by the HR worthies. The whole arguments about fake certificates and bad performers was brought up simply to insult the employees sitting opposite to them. In fact, watching the show, it was hard to shake off the feeling that we were watching the age old fight in India between oppressive upper classes, all well-fed and bloated with their power, representing HR; while the lower classes were cowering at their allegations on the employees side. None of the employees brought up very obvious legal issues - what the guy in the photograph said was illegal, and if his company is following such practices of questioning reproductive habits, they can be shut down. The reason I feel enraged is because bad talking points are pushed by corporations and their representative lackeys all the time ; and they are repeated again and again across the media spectrum. And they become common wisdom. Why did the economy come down? Why are companies laying off thousands? Because they are all bad performers. We badly need an IT employee's union which can push back such talking points in public at least. The rest of this post will be a debunking of some of these talking pints. First of all the show should never have been titled "HR vs Employees". The assumption was that HR is somewhat different than employees. This is a big psychological issue - the corporate structure in India is structured around power instead of utility and convenience. In the United States HR plays a very different role. In fact, a HR manager in the United States will be the last person to make a comment about employing women. In India HR has become compliant lackeys who would do the management's dirty work for them. The reason it works well is because HR knows the law. Most employees do not know their rights. In the corporate structure in India, executive management needs to be distinguished from other management areas - for example, the Administration department is called Facilities Management. This does not mean that admin staff are managers who can mess with other people. Project management means you manage IT projects. That does not mean that you run the company. Similarly Human Resources Management means you manage employee's welfare. You are NOT in charge of profit making. In fact, your role is to guide Executive management to avoid excesses and treat employees fairly. By calling the show "HR vs Employees" the show hosts implied that Human Resources staff themselves are somehow special. In reality, the company is run by executive management (CTO, COO, CEO, CFO). The decisions that they feel squeamish about are handed over to a HR manager who then assumes that he has a role in profit making. In exchange for the illusory "power" they get from executive management, HR managers end up doing the opposite of their jobs. And they, true to Indian tradition, abuse the power too. I will explain later why this is bad for long-term health of a company. This distinction, that they are NOT "management" management was lost on most people in the debate show. They sought to speak on behalf of executive management themselves - a job they are not qualified to do. This argument is plain offensive and I see it repeated again and again only in India. The recession has caused massive layoffs in the USA. I do not see ANY companies in America insulting their former employees and calling them bad performers. They know that they will be sued off their money if they claimed as such. The reason HR continues to peddle this nonsense is because they think no one can reliably respond to this charge. Who wants to come out and say, "I was laid off and I performed my job well"? The idea that absolute "performance" can be somehow magically figured out in a medium-sized company by HR, of all people, is hilarious. HR has NO clue about project performance. It is surprising that they are defending this issue. The layoff process does not START with HR. It comes from executive management to the account managers or bench managers. These managers then make lists. Almost all the time, the list contains non-billable resources. The key concept here is this - the company has ALREADY started losing clients. Thus the COMPANY is the entity performing poorly. Nobody does mass layoffs of "non-performing" resources when clients are paying money for those resources. HR gets into the process very late. All that they get is a list and a request to "manage" the layoffs. So, that is ALL that they have to say: we get lists and we do the dirty work. Don't blame us. Instead, here they are, covering for their bosses and pretending they run a company. Power corrupts indeed. A layoff is different from a firing. When a company faces major shortfalls in profits and loss of clients, they need to shed some of their employees. Companies cut entire departments. That does not mean everyone in that department is a "bad performer". Atleast the government should make this dictinction obvious (it DOES exist in labor law in India). TCS, IBM and many other companies have got away with calling everyone a bad performer but themselves. How can a capitalist society function sanely when companies refuse to obey the law and insist on an agreesive offense on labor? By the way, these were the same companies which kept screaming "loyalty" and promoted that as a virtue - when the times got tough for them, they have not only laid off their loyal employees, they also insult them by calling them bad performers. Finally, I would like to address HR guy in the photo and explain why he is wrong and causes harm to his company. In India, when you say something against the law, it does not seem to matter much. It somehow does not seem to impress people that a "point-of-view" is against the law. The reason is an attitude that considers law as a flexible guideline; in a country where powerful people get away, literally, with murder, this is not surprising. Thus we see the photo-HR-guy talking about a point of view and say, "what is wrong with that". The first thing that is wrong, is of course, that discrimination based on reproductive habits is against the law. A candidate can succefully sue a company for asking questions about future pregnancy or current pregnancy. Secondly, the argument "management needs profit; will you work without a pay" is completely a false choice. The counter is if he is willing to go to jail or pay a fine for discrimination. By his logic, management can violate the law as long as they are having a profit out of it. This is a dangerous argument - by that logic you should be able to beat up people for leaving a company, because from the management's "point-of-view" people should stay in their company. It is very irritating to hear this "point-of-view" arguments from corporate jalras. They are implying that a company is some kind of super-legal entity, having the power to do anything as long as they are "creating jobs" ( a new buzz word these days). Remember the Mani Rathnam movie "Guru"? The "Guru" justifies violating the law because he wanted India to grow. It is just convenient that he made lots of money in that process. He also caused the failure of other competitive businessmen who actually followed the law; but that is fine as long as India is growing. I am tired of this kind of false arguments about "utility" from corporations. The common citizen is forced to follow the law. He is punished heavily for even perceived violations. Meanwhile corporations continue to claim that they are "creating jobs" and violate laws constantly. Why doesn't the law apply to them? But I am guessing that the above two arguments won't impress our photo-HR-guy. So, let me explain a third reason why he is wrong - his "idea" of not employing women who are likely to get pregnant will entirely shut down his company eventually, if implemented. I have interviewed more than thousand candidates for technical positions. That HR guy, I am sure, has not. It is very hard finding right people for technical jobs as it is. The idea that you can just eliminate 50% of the candidates (because they are young women) and then try to fill positions in a tech company is just ridiculous. The HR guy thinks qualified people are infinitely available. Let me assure you, they are not. We cannot afford to eliminate people based on gender, disability, age or region. It just limits the talent pool and makes it very hard to compete with other companies. This is, in fact, ONE of the reasons laws exist. Labor laws are not cruel rules imagined by communists so that noble businessmen would suffer. Ultimately they promote fairness in a society and that fairness helps the society in the LONG TERM. That HR guy, in fact, makes the crucial mistake of making decisions about things he is not qualified to - as I said above, HR is not in charge of profit making (for a good reason). When he actually imagines that he, somehow, is promoting the profits of a company, he is only acting in a short-term perspective. That is natural because he is NOT trained to run a profit-center. But he is so power-drunk that he assumes that his "ideas" about project staffing apply to the whole company - they don't. I really hope his company is not listening to him, for their own sake. This is also the reason we should not accept when politicians or businessmen insist that they violated laws for other people's benefits or for the nation's welfare. Following the rule of law is the best way to guarantee success - not cowboy ideas about eliminating women from the competition. Extremely well written post.. I guess everyone who saw the program feels the same way.. What these TV channels are doing for their TRP is very wrong.. People get a false impression about how the IT industry works..
2. If they have spoken their views even against these rules laid down by the host chances are they might have edited out that portion while telecasting it. Finally it comes to the crew as to how they will telecast the show favoring one party..
"Ramalinga Raju steals money and gets caught!! Let us start blaming oursleves!" What a plight - you suddenly realise that an employee who has been with you for so many months has all of a sudden become a "non performer " , so who could give him/her their ideology or proper definition of being called as a non performer !! ?? You ask too many questions and you are charged of having "attitude" problems and not being flexible . I was browsing somewhere and I land on this nice blog!! Kudos mate, a nice blog with good posts. I am not a big fan of stories and I don't read short-stories/fiction but I like all other blogs by you !! Very analytical ! Good Post Ramiah. Most of the talks shows are well reheresed. Well, aren't HR themselves employees of an organization? Excellent post Ramiah. pretty valid points I must say. "The HR guys in this show have no problem questioning rights which were hard won by labor and have become part of law for the last 50 years"
As for the discrimination part, you could get sued for asking the gender of the employee, leave alone the rest. As for this HR hero, I believe he got himself fired right there on the show by saying such things. Great points! Very well said. I found those comments irksome too. Thank you for voicing out the thoughts of thousands.